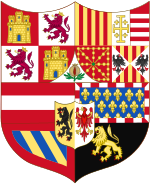 Habsburg Spain refers to Spain over the 16th and 17th centuries (1516–1700), when it was ruled by kings from the House of Habsburg (also associated with its role in the history of Central Europe). The Habsburg rulers (chiefly Charles I and Philip II) reached the zenith of their influence and power. They controlled territory that included the Americas, the East Indies, the Low Countries and territories now in France and Germany in Europe, the Portuguese Empire from 1580 to 1640, and various other territories such as small enclaves like Ceuta and Oran in North Africa. This period of Spanish history has also been referred to as the "Age of Expansion". "Spain" or "the Spains" in this period covered the entire peninsula, politically a confederacy comprising several, nominally independent kingdoms or realms in personal union: Aragon, Castile, León, Navarre and, from 1580, Portugal. In some cases, these individual kingdoms themselves were confederations, most notably, the Crown of Aragon ( Principality of Catalonia, Kingdom of Aragon, Kingdom of Valencia, and the Kingdom of Majorca). The marriage of Isabella I of Castile and Ferdinand II of Aragon in 1469 had enabled the union of two of the greatest of these kingdoms, Castile and Aragón, which led to their largely successful campaign against the Moors, peaking at the conquest of Granada in 1492. Spain as a unified state came into being de jure only after the Nueva Planta decrees of 1707 (that were a unilateral Royal edict) from the contested successor to the multiple Crowns of its former realms. After the death in 1700 of Charles II and with it the extinction of the Spanish Habsburg dynasty, the Spanish Succession war lasted for many years between its contesting dynasties from France and Austria and their respective supporting allies, until the ascension of Philip V and the inauguration of the Bourbon dynasty when this centralizing legal vehicle for new State formation, without legal precedent in the Iberian realms (or the ratification of the dismissed Courts of Aragon, Catalonia and Valencia, whose Laws were not sworn in order to be crowned) and of clear foreign origin, in all comparable after those in France under the Old Regime Absolutism, were established after de facto. In 1504, Isabella I died, and although Ferdinand II tried to maintain his position over Castile in the wake of her death, the Castilian Cortes Generales (the royal court of Spain) chose to crown Isabella's daughter Joanna as queen. Her husband Philip I was the Habsburg son of the Holy Roman Emperor Maximilian I and Mary of Burgundy. Shortly thereafter Joanna began to lapse into insanity, though the extent of her mental illness was the topic of some debate. In 1506, Philip I was declared jure uxoris king, but he died later that year under mysterious circumstances, possibly poisoned by his father-in-law, Ferdinand II. Since their oldest son Charles was only six, the Cortes reluctantly allowed Joanna's father Ferdinand II to rule the country as the regent of Joanna and Charles. Spain was now in personal union under Ferdinand II of Aragon. As undisputed ruler in most of the Peninsula, Ferdinand adopted a more aggressive policy than he had as Isabella's husband, going on to crystallize his long-running designs over Navarre into a full-blown invasion led initially by a Castilian military expedition, and supported later by Aragonese troops (1512). He also attempted to enlarge Spain's sphere of influence in Italy, strengthening it against France. As ruler of Aragon, Ferdinand had been involved in the struggle against France and the Republic of Venice for control of Italy; these conflicts became the center of Ferdinand's foreign policy as king. Ferdinand's first investment of Spanish forces came in the War of the League of Cambrai against Venice, where the Spanish soldiers distinguished themselves on the field alongside their French allies at the Battle of Agnadello (1509). Only a year later, Ferdinand joined the Holy League against France, seeing a chance at taking both Naples — to which he held a dynastic claim — and Navarre, which was claimed through his marriage to Germaine of Foix. The war was less of a success than that against Venice, and in 1516 France agreed to a truce that left Milan under French control and recognized Spanish hegemony in northern Navarre. Ferdinand would die later that year. Ferdinand's death led to the ascension of young Charles to the throne as Charles I of Castile and Aragon, effectively founding the monarchy of Spain. His Spanish inheritance included all the Spanish possessions in the New World and around the Mediterranean. Upon the death of his Habsburg father in 1506, Charles had inherited the Netherlands and Franche-Comté, growing up in Flanders. In 1519, with the death of his paternal grandfather Maximilian I, Charles inherited the Habsburg territories in Germany, and was duly elected as Holy Roman Emperor that year. 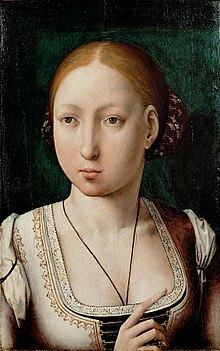 His mother Joanna remained titular queen of Castile until her death in 1555, but due to her mental health and worries of her being proposed as an alternative monarch by opposition (as happened in the Revolt of the Comuneros), Charles kept her imprisoned. At that point, Emperor and King Charles was the most powerful man in Christendom. The accumulation of so much power by one man and one dynasty greatly concerned Francis I of France, who found himself surrounded by Habsburg territories. In 1521 Francis invaded the Spanish possessions in Italy and Navarre, which inaugurated a second round of Franco-Spanish conflict. The war was a disaster for France, which suffered defeats at Biccoca (1522), Pavia (1525, at which Francis was captured), and Landriano (1529) before Francis relented and abandoned Milan to Spain once more. Charles's victory at the Battle of Pavia (1525) surprised many Italians and Germans and elicited concerns that Charles would endeavor to gain even greater power. Pope Clement VII switched sides and now joined forces with France and prominent Italian states against the Habsburg Emperor, in the War of the League of Cognac. In 1527, due to Charles' inability to pay them sufficiently, his armies in Northern Italy mutinied and sacked Rome itself for loot, forcing Clement, and succeeding popes, to be considerably more prudent in their dealings with secular authorities: in 1533, Clement's refusal to annul Henry VIII of England's marriage to Catherine of Aragon (Charles' aunt) was a direct consequence of his unwillingness to offend the emperor and perhaps have his capital sacked a second time. The Peace of Barcelona, signed between Charles and the pope in 1529, established a more cordial relationship between the two leaders that effectively named Spain as the protector of the Catholic cause and recognized Charles as king of Lombardy in return for Spanish intervention in overthrowing the rebellious Florentine Republic. In 1543, Francis I, king of France, announced his unprecedented alliance with the Ottoman sultan, Suleiman the Magnificent, by occupying the Spanish-controlled city of Nice in cooperation with Turkish forces. Henry VIII of England, who bore a greater grudge against France than he held against the Emperor for standing in the way of his divorce, joined Charles in his invasion of France. Although the Spanish army was soundly defeated at the Battle of Ceresole, in Savoy Henry fared better, and France was forced to accept terms. The Austrians, led by Charles's younger brother Ferdinand, continued to fight the Ottomans in the east. With France defeated, Charles went to take care of an older problem: the Schmalkaldic League. The Protestant Reformation had begun in Germany in 1517. Charles, through his position as Holy Roman Emperor, his important holdings along Germany's frontiers, and his close relationship with his Habsburg relatives in Austria, had a vested interest in maintaining the stability of the Holy Roman Empire. The German Peasants' War broke out in Germany in 1524 and ravaged the country until it was brutally put down in 1526; Charles, even as far away from Germany as he was, was committed to keeping order. After the Peasants' War the Protestants organized themselves into a defensive league to protect themselves from Emperor Charles. Under the protection of the Schmalkaldic League, the Protestant states committed a number of outrages in the eyes of the Catholic Church— the confiscation of some ecclesiastical territories, among other things— and defied the authority of the Emperor. Perhaps more important to the strategy of the Spanish king, the League had allied itself with the French, and efforts in Germany to undermine the League had been rebuffed. Francis's defeat in 1544 led to the annulment of the alliance with the Protestants, and Charles took advantage of the opportunity. He first tried the path of negotiation at the Council of Trent in 1545, but the Protestant leadership, feeling betrayed by the stance taken by the Catholics at the Council, went to war, led by the Saxon elector Maurice. In response, Charles invaded Germany at the head of a mixed Dutch-Spanish army, hoping to restore the Imperial authority. The Emperor personally inflicted a decisive defeat on the Protestants at the historic Battle of Mühlberg in 1547. In 1555, Charles signed the Peace of Augsburg with the Protestant states and restored stability in Germany on his principle of cuius regio, eius religio ("whose realm, his religion"). Charles's involvement in Germany would establish a role for Spain as protector of the Catholic Habsburg cause in the Holy Roman Empire. In 1526, Charles married Infanta Isabella, the sister of John III of Portugal. In 1556 he abdicated from his positions, giving his Spanish empire to his only surviving son, Philip II of Spain, and the Holy Roman Empire to his brother, Ferdinand. Charles retired to the monastery of Yuste ( Extremadura, Spain), and died in 1558. Spain was not yet at peace, as the aggressive Henry II of France came to the throne in 1547 and renewed the conflict with Spain. Charles' successor, Philip II, aggressively conducted the war against France, crushing a French army at the Battle of St. Quentin in Picardy in 1557 and defeating Henry again at the Battle of Gravelines the following year. The Peace of Cateau-Cambrésis, signed in 1559, permanently recognized Spanish claims in Italy. In the celebrations that followed the treaty, Henry was killed by a stray splinter from a lance. France was stricken for the next thirty years by civil war and unrest (see French Wars of Religion) and was unable to effectively compete with Spain and the Habsburgs in the European power struggle. Freed from any serious French opposition, Spain saw the apogee of its might and territorial reach in the period 1559–1643. The Peace of Cateau-Cambresis in 1559 concluded the war with France, leaving Spain at a considerable advantage. However, the government was in enormous debt and declared bankruptcy that year. Most of the government's revenues came from taxes and excise duties, not imported silver and other goods. The Ottoman Empire had long menaced the fringes of the Habsburg dominions in Austria and northwest Africa, and in response Ferdinand and Isabella had sent expeditions to North Africa, capturing Melilla in 1497 and Oran in 1509. Charles had preferred to combat the Ottomans through a considerably more maritime strategy, hampering Ottoman landings on the Venetian territories in the Eastern Mediterranean. Only in response to raids on the eastern coast of Spain did Charles personally lead attacks against holdings in North Africa (1545). In 1560, the Ottomans battled the Spanish navy off the coast of Tunisia, but in 1565 Ottoman troops landing on the strategically vital island of Malta, defended by the Knights of St. John, were defeated. The death of Suleiman the Magnificent the following year and his succession by Selim the Sot emboldened Philip, who resolved to carry the war to the Ottoman homelands. 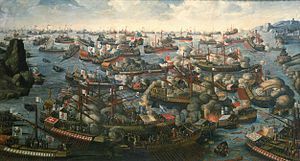 In 1571, a mixed naval expedition of Spanish, Venetian, and papal ships led by Charles' illegitimate son Don John of Austria annihilated the Ottoman fleet at the Battle of Lepanto, in the largest naval battle fought in European waters since Actium in 31 BC. The fleet included Miguel de Cervantes, future author of the historic Spanish novel Don Quixote. The victory curbed the Ottoman naval threat against European territory, particularly in the western Mediterranean, and the loss of experienced sailors was to be a major handicap in facing Christian fleets. Yet the Turks succeeded in rebuilding their navy in a year, using it handily to consolidate Ottoman dominance over most of the Mediterranean's African coast and eastern islands. Philip lacked the resources to fight both the Netherlands and the Ottoman Empire at the same time, and the stalemate in the Mediterranean continued until Spain agreed to a truce in 1580. The time for rejoicing in Madrid was short-lived. In 1566, Calvinist-led riots in the Spanish Netherlands (roughly equal to modern-day Netherlands and Belgium, inherited by Philip from Charles and his Burgundian forebearers) prompted the Duke of Alva to conduct a military expedition to restore order. Alva launched an ensuing reign of terror. In 1568, William the Silent led a failed attempt to drive Alva from the Netherlands. This attempt is generally considered to signal the start of the Eighty Years' War that ended with the independence of the United Provinces. The Spanish, who derived a great deal of wealth from the Netherlands and particularly from the vital port of Antwerp, were committed to restoring order and maintaining their hold on the provinces. In 1572, a band of rebel Dutch privateers known as the watergeuzen ("Sea Beggars") seized a number of Dutch coastal towns, proclaimed their support for William and denounced the Spanish leadership. In 1574, the Spanish army under Luis de Requeséns was repulsed from the Siege of Leiden after the Dutch destroyed the dykes that held back the North Sea from the low-lying provinces. In 1576, faced with the costs of his 80,000-man army of occupation in the Netherlands and the massive fleet that had won at Lepanto, Philip was forced to accept bankruptcy. The army in the Netherlands mutinied not long after, seizing Antwerp and looting the southern Netherlands, prompting several cities in the previously peaceful southern provinces to join the rebellion. The Spanish chose the route of negotiation, and pacified most of the southern provinces again with the Union of Arras in 1579. The Arras agreement required all Spanish troops to leave these lands. Meanwhile, Philip had his eye on uniting the entire Iberian peninsula under his rule, a traditional objective of Spanish monarchs. The opportunity came in 1578 when the Portuguese king Sebastian launched a crusade against Morocco. The expedition ended in disaster and Sebastian's disappearance at the Battle of the Three Kings. His aged uncle Henry ruled until he died in 1580. Although Philip had long prepared for the takeover of Portugal, he still found it necessary to launch a military occupation led by the Duke of Alva. Philip took the title of King of Portugal, but otherwise the country remained autonomous, retaining its own laws, currency, and institutions. However, Portugal surrendered all independence in foreign policy, and relations between the two countries were never warm. France formed the cornerstone of Spanish foreign policy. For 30 years after Cateau-Cambresis, it was engulfed in civil wars. After 1590, the Spanish intervened directly in France, winning battles, but failing to prevent Henry of Navarre from becoming king as Henry IV. To Spain's dismay, Pope Clement VIII accepted Henry back into the Catholic Church. To keep the Netherlands under control required an extensive occupation force, and Spain was still financially strapped since the 1576 bankruptcy. In 1584, William the Silent was assassinated by a Catholic, and the death of the popular Dutch resistance leader was expected to bring an end to the war; it did not. In 1586, Queen Elizabeth I of England, supported the Protestant cause in the Netherlands and France, and Sir Francis Drake launched attacks against Spanish merchants in the Caribbean and the Pacific Ocean, along with a particularly aggressive attack on the port of Cadiz. Philip sent the Spanish Armada to attack England. Numbering 130 ships and 30,000 men, it was led by the Duke of Medina-Sidona. The Armada's goal was to ferry Spanish troops from the Netherlands to invade England. After three days of fighting with the English fleet, the Armada withdrew and was forced to make the journey around the coast of Scotland and Ireland, many ships being wrecked by storms. Spain had invested itself in the religious warfare in France after Henry II's death. In 1589, Henry III, the last of the Valois lineage, died at the walls of Paris. His successor, Henry IV of France, the first Bourbon king of France, was a man of great ability, winning key victories against the Catholic League at Arques (1589) and Ivry (1590). Committed to stopping Henry from becoming King of France, the Spanish divided their army in the Netherlands and invaded France in 1590. Faced with wars against England, France, and the Netherlands, the Spanish government found that neither the New World silver nor steadily increasing taxes were enough to cover their expenses, and went bankrupt again in 1596. To bring finances into order, military campaigns were reduced and the over-stretched forces went into a largely defensive mode. In 1598, shortly before his death, Philip II made peace with France, withdrawing his forces from French territory and stopping payments to the Catholic League after accepting the new convert to Catholicism, Henry IV, as the rightful French king. Meanwhile, Castile was ravaged by a plague that had arrived by ship from the north, losing half a million people. Yet as the 17th century began, and despite her travails, Spain was still unquestionably the dominant power. Philip III succeeded his father in 1598 but had no interest in politics or government, preferring to engage in lavish court festivities, religious indulgences, and the theatre. He needed someone to do the work of governing, and he settled on the Duke of Lerma. Under the guidance of Lerma, Philip III's government resorted to a tactic that had been resolutely resisted by Philip II, paying for the budget deficits by the mass minting of increasingly worthless vellones, causing inflation. In 1607, the government faced bankruptcy. Peace with England and France implied that Spain could focus her energies on restoring her rule to the Dutch provinces. The Dutch, led by Maurice of Nassau, the son of William the Silent had succeeded in taking a number of border cities since 1590, including the fortress of Breda. Following the peace with England, the new Spanish commander Ambrosio Spinola pressed hard against the Dutch. 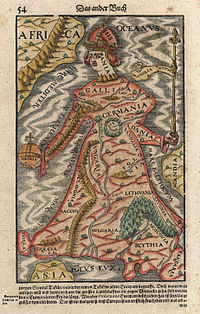 Spinola, a general of abilities to match Maurice, was prevented from conquering the Netherlands only by Spain's renewed bankruptcy in 1607. Fortunately, Spanish forces had regained enough of the military initiative to convince a politically divided United Provinces to sign a truce in 1609. Spain recovered during the truce, ordering her finances and doing much to restore her prestige and stability in the run-up to the last truly great war in which she would participate as the leading power. In the Netherlands, the rule of Philip II's daughter, Isabella Clara Eugenia, and her husband, Archduke Albert, restored stability to the southern Netherlands. But Philip III and Lerma lacked the ability to make any meaningful change in the country's foreign policy. They clung to the idea of placing the infanta Isabella on the English throne after Queen Elizabeth's death and sent a limited expeditionary force to Ireland to aid the Spanish-supplied rebels. The English defeated it, but the long war of attrition there had drained England of money, men, and morale: Elizabeth's successor, James I, wanted a fresh start to his reign. The war that had been going on between the two countries since 1585 finally ended. War with France threatened in 1610, but shortly after, Henry IV was assassinated, and the country fell into civil war again. Up until 1630, Spain was at peace and continued its dominant position in Europe. Meanwhile, Lerma's enemies expelled him from office in 1617, and Baltazar de Zúñiga began calling for a more aggressive foreign policy. In 1618, beginning with the Defenestration of Prague, Austria and the Holy Roman Emperor, Ferdinand II of Germany, embarked on a campaign against the Protestant Union and Bohemia. Zúñiga encouraged Philip to join the Austrian Habsburgs in the war, and Ambrogio Spinola, the rising star of the Spanish army, was sent at the head of the Army of Flanders to intervene. Thus, Spain entered into the Thirty Years’ War. Olivares was a man out of time; he realized that Spain needed to reform, and to reform it needed peace. The destruction of the United Provinces of the Netherlands was necessary. Dutch colonial policy tried to undermine Spanish and Portuguese hegemony. Spinola and the Spanish army were focused on the Netherlands, and the war seemed to be going in Spain's favor. In 1627, the Castilian economy collapsed. The Spanish had been debasing their currency to pay for the war and prices exploded in Spain just as they had in previous years in Austria. Until 1631, parts of Castile operated on a barter economy as a result of the currency crisis, and the government was unable to collect any meaningful taxes from the peasantry, depending instead on its colonies ( Spanish treasure fleet). The Spanish armies in Germany resorted to "paying themselves" on the land. 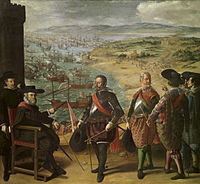 Olivares, who had backed certain tax measures in Spain pending the completion of the war, was further blamed for a fruitless war in Italy (see War of the Mantuan Succession). The Dutch, who during the Twelve Years’ Truce had made their navy a priority, proceeded to plunder Spanish and (especially) Portuguese maritime trade, on which Spain was wholly dependent after the economic collapse. Spanish victories in Germany and Italy were not enough to matter, and their navy began suffering losses. In 1630, Gustavus Adolphus of Sweden landed in Germany and relieved the port of Stralsund that was the last stronghold on the continent held by German forces belligerent to the Emperor. Gustav then marched south winning notable victories at Breitenfeld and Lutzen, attracting greater support for the Protestant cause the further he went. The situation for the Catholics improved with Gustav's death at Lutzen in 1632 and a shocking victory for Imperial forces under Cardinal-Infante Ferdinand and Ferdinand II of Hungary at Nordlingen in 1634. From a position of strength, the Emperor approached the war-weary German states with a peace in 1635; many accepted, including the two most powerful, Brandenburg and Saxony. Cardinal Richelieu had been a strong supporter of the Dutch and Protestants since the beginning of the war, sending funds and equipment in an attempt to stem Habsburg strength in Europe. Richelieu decided that the recently signed Peace of Prague was contrary to French interests and declared war on the Holy Roman Emperor and Spain within months of the peace being signed. The more experienced Spanish forces scored initial successes; Olivares ordered a lightning campaign into northern France from the Spanish Netherlands, hoping to shatter the resolve of King Louis XIII's ministers and topple Richelieu before the war exhausted Spanish finances and France's military resources could be fully deployed. 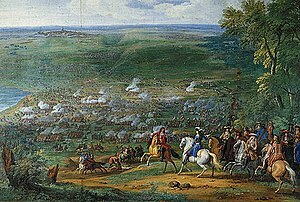 In the "année de Corbie", 1636, Spanish forces advanced as far south as Amiens and Corbie, threatening Paris and quite nearly ending the war on their terms. After 1636, however, Olivares stopped the advance. The French thus gained time to properly mobilise. At the Battle of the Downs in 1639 a Spanish fleet was destroyed by the Dutch navy, and the Spanish found themselves unable to adequately reinforce and supply their forces in the Netherlands. The Spanish Army of Flanders, which represented the finest of Spanish soldiery and leadership, faced a French advance led by Louis II de Bourbon, Prince de Condé in northern France at Rocroi in 1643. The Spanish, led by Francisco de Melo, were routed. One of Spain's best and most famous armies had suffered defeat on the battlefield. Supported by the French, the Catalans, Neapolitans, and Portuguese rose up in revolt against the Spanish in the 1640s. With the Spanish Netherlands now very much on the defensive between French and Dutch forces after the Battle of Lens in 1648, the Spanish made peace with the Dutch and recognized the independent United Provinces in the Peace of Westphalia that ended both the Eighty Years' War and the Thirty Years' War. Olivares attempted to suppress the Catalan Revolt by launching an invasion of southern France. The quartering of Spanish troops in Catalonia only made the situation worse, and the Catalans decided to secede from Spain altogether and unite with France. French troops soon arrived in Catalonia, but when a renewed civil war (the Fronde) broke out at home, their domestically distracted forces were driven out in 1652 by Catalan and Spanish Habsburg forces. England now entered the war and occupied Jamaica. The long, desultory and weary struggle effectively ended at the Battle of the Dunes (1658) where the French army under Vicomte de Turenne (along with some English help) defeated the Spanish army of the Netherlands. Spain agreed to the Peace of the Pyrenees in 1659 that ceded to France Artois, Roussillon, and portions of Lorraine. Meanwhile, the Portuguese took advantage of the Catalan revolt to declare their own independence in 1640. The 60 years of union between Portugal and Spain were not happy. The Portuguese fluent Philip II visited the country twice, but Philip III only once, in a short formal visit, and Philip IV never bothered to. The Spanish, hard pressed elsewhere, were blamed for inadequately protecting Portugal's overseas colonies from the Dutch (who annexed parts of Colonial Brazil), and in a time of economic downturn, the Spanish colonies did not enjoy having to trade and compete with their Portuguese counterparts. Moreover, Portugal's autonomous status as an equal in the union went into decline after Philip II and was treated increasingly in the great councils of state as a province. After Portugal declared independence and chose the Duke of Braganza as King John IV, Spain was distracted with a Revolt in Andalusia and thus chose to not do anything about it. The Portuguese Revolt was partially what led Spain to conclude peace with France in 1659. But the government had gone bankrupt again in 1647 and 1653, and the nobility wouldn't give an inch on financial and tax reforms. Portuguese victories in 1663 at Ameixial and in 1665 at Vila Viçosa secured their independence, and in 1668 Spain recognized Portugal's sovereignty. Philip IV, who had seen over the course of his life the declining influence of Spain's empire, sank slowly into depression after he had to dismiss his favorite courtier, Olivares, in 1643. In 1646, his eldest son and heir Don Baltasar Carlos died at the age of 16. Charles was manipulated by various political factions throughout his life. For a short time under Don Juan José de Austria as valido the nobility came to dominate Spain once again. Most were self-serving, but there were a few such as the Count of Oropesa, who managed (despite ruinous deflation) to stabilize the currency. Others tried to weaken the power of the Inquisition (which however was not abolished until 1808) and encourage economic development. Even so, Spain's economy (especially in Castile) declined and its population decreased by nearly two million people during the 17th century. This was partially due to plague outbreaks, and partially due to the huge casualties caused by almost continuous warfare. The period 1677-1686 was a low point, with famine, plague, natural disasters, and economic upheaval. Emigration to the New World increased. France was now strong and united under Louis XIV, and after the Treaty of the Pyrenees (1659) took Spain's place as the dominant power in Europe. Three wars were fought during this period, the War of Devolution (1667–1668), the Franco-Dutch War (1672–1678), and the War of the Grand Alliance (1688–1697). Although Spain's territorial losses (the Franche-Comté, some towns in the Southern Netherlands and part of the island of Hispaniola) were relatively few, it had demonstrated some vulnerability, and Louis XIV (and indeed the other European rulers) had plans for when Charles II's death came, as it was clear that he would produce no children and the Habsburg line in Spain would die with him. The end came with Charles' passing at the age of 39 on November 1, 1700. The Spanish Inquisition was formally launched during the reign of the Catholic Monarchs, continued by their Habsburg successors, and only ended in the 19th century. Under Charles I the Inquisition became a formal department in the Spanish government, hurtling out of control as the 16th century progressed. Philip II greatly expanded the Inquisition and made church orthodoxy a goal of public policy. In 1559, three years after Philip came to power, students in Spain were forbidden to travel abroad, the leaders of the Inquisition were placed in charge of censorship, and books could no longer be imported. Philip vigorously tried to excise Protestantism from Spain, holding innumerable campaigns to eliminate Lutheran and Calvinist literature from the country, hoping to avoid the chaos taking place in France. Philip was more religious than his father, and was convinced that if the Protestants were resorting to military force, then he must do likewise. He was willing to do whatever it took to fight the heretics and preserve Spanish hegemony, even intervening in papal elections to ensure the choosing of a pro-Spanish pope. Philip succeeded three times with popes Urban VII, Gregory XIV, and Innocent IX. But the fourth time, he failed to prevent the election of the pro-French Clement VIII. The church in Spain had been purged of many of its administrative excesses in the 15th century by Cardinal Ximenes, and the Inquisition served to expurgate many of the more radical reformers who sought to change church theology as the Protestant reformers wanted. Instead, Spain became the scion of the Counter-reformation as it emerged from the Reconquista. Spain bred two unique threads of counter-reformationary thought in the persons of Saint Theresa of Avila and the Basque Ignatius Loyola. Theresa advocated strict monasticism and a revival of more ancient traditions of penitence. She experienced a mystical ecstasy that became profoundly influential on Spanish culture and art. Ignatius Loyola, founder of the Jesuit Order, was influential across the world in his stress on spiritual and mental excellence and contributed to a resurgence of learning across Europe. In 1625, a peak of Spanish prestige and power, the Count-Duke of Olivares established the Jesuit colegia imperial in Madrid to train Spanish nobles in the humanities and military arts. The Moriscos of southern Spain had been forcibly converted to Christianity in 1502, but under the rule of Charles I they had been able to obtain a degree of tolerance from their Christian rulers. They were allowed to practice their former custom, dress, and language, and religious laws were laxly enforced. (However, Charles also passed the Limpieza de sangre, a law that excluded those not of pure Old Christian, non-Jewish blood from public office.) Philip began to put back into place the restrictive laws of generations before and in 1568 the Moriscos rebelled (see Morisco Revolt). The revolt was only put down by Italian troops under Don John of Austria, and even then the Moriscos retreated to the highlands and were not defeated until 1570. The revolt was followed by a massive resettlement program in which 12,000 Christian peasants replaced the Moriscos. In 1609, on the advice of the Duke of Lerma, Philip III expelled the 300,000 Moriscos of Spain. The expulsion of the industrious Jews, Moors, and Moriscos did nothing to advance the Spanish economy. The small scattered groups of Moriscos lived largely by subsistence farming in marginal mountain areas or by unskilled laboring in a country that had very many underemployed hands. 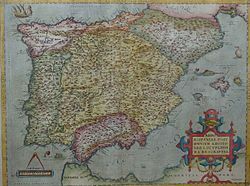 A council set up to investigate the matter in Castile found little effect, but in parts of Aragon and especially Valencia, where half the Moriscos had lived, and had made up a substantial minority of the population, the impact was certainly noticeable for the noblemen who had lost rents. The Spanish received a large influx of gold from the colonies in the New World as plunder when they were conquered, much of which Charles used to prosecute his wars in Europe. In the 1520s silver began to be extracted from the rich deposits at Guanajuato, but it was not until the 1540s, with the opening of the mines at Potosí and Zacatecas, that silver was to become the fabled source of wealth it has assumed in legend. The Spanish left mining to private enterprise but instituted a tax known as the "quinto real" whereby a fifth of the metal was collected by the government. The Spanish were quite successful in enforcing the tax throughout their vast empire in the New World; all bullion had to pass through the House of Trade in Seville, under the direction of the Council of the Indies. The supply of Almadén mercury, vital to extracting silver from the ore, was controlled by the state and contributed to the rigor of Spanish tax policy. Inflation - both in Spain and in the rest of Europe - was primarily caused by debt, but a level of debt made possible later by the rising silver imports; Charles had conducted most of his wars on credit, and in 1557, a year after he abdicated, Spain was forced into its first debt moratorium, setting a pattern that would be repeated with ever more disruptive economic consequences. Few Spaniards initially gave a thought to the wholesale slaughter, enslavement, and forced conversion of Native Americans either, although some men such as Bartolomé de las Casas argued for more humane treatment of them. This led to much debate and governmental action. The Laws of Burgos, the New Laws, and other legal and institutional changes somewhat alleviated conditions for Native Americans, including the freeing of all Native American slaves. Faced with the growing threat of piracy, in 1564 the Spanish adopted a convoy system far ahead of its time, with treasure fleets leaving America in April and August. The policy proved efficient, and was quite successful. Only two convoys were captured; one in 1628 when it was captured by the Dutch, and another in 1656, captured by the English, but by then the convoys were a shadow of what they had been at their peak at the end of the previous century. Nevertheless, even without being completely captured they frequently came under attack, which inevitably took its toll. Not all shipping of the dispersed empire could be protected by large convoys, allowing the Dutch, English and French privateers and pirates the opportunity to attack trade along the American and Spanish coastlines and raid isolated settlements. This became particularly savage from the 1650s, with all sides falling to extraordinary levels of barbarity, even by the harsh standards of the time. Spain also responded with no small amount of privateering, using the recaptured city of Dunkirk as a base for its Dunkirk Raiders to molest Dutch, English and French trade. More seriously, the Portuguese part of the empire, with its chronically undermanned African and Asian forts, proved nearly impossible to defend adequately, and with Spain so fully engaged on so many fronts, it could spare little for their defense. 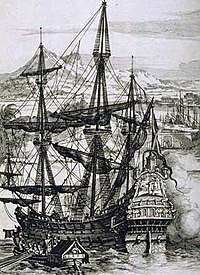 Spain also had to deal with Ottoman backed Barbary piracy in the Mediterranean - a vastly greater menace than Caribbean piracy, as well as Oriental and Dutch piracy in the waters around the Philippines. The growth of Spain's empire in the New World was accomplished from Seville, without the close direction of the leadership in Madrid. Charles I and Philip II were primarily concerned with their duties in Europe, and thus control of the Americas was handled by viceroys and colonial administrators who operated with virtual autonomy. The Habsburg kings regarded their colonies as feudal associations rather than integral parts of Spain. No Spanish king could, or did, visit the colonies, either. 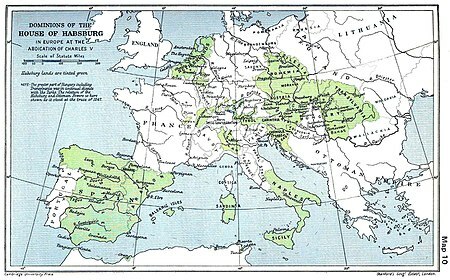 The Habsburgs, whose family had traditionally ruled over diverse, noncontiguous domains and had been forced to devolve autonomy to local administrators, replicated those feudal policies in Spain, particularly in the Basque country and Aragon. This meant that taxes, infrastructure improvement, and internal trade policy were defined independently by each territory, leading to many internal customs barriers and tolls, and conflicting policies even within the Habsburg domains. Charles I and Philip II had been able to master the various courts through their impressive political energy, but the much weaker Philip III and IV allowed it to decay, and Charles II was incapable of controlling anything at all. The development of Spain itself was hampered by the fact that Charles I and Philip II spent most of their time abroad; for most of the 16th century, Spain was administrated from Brussels and Antwerp, and it was only during the Dutch Revolt that Philip returned to Spain, where he spent most of his time in the seclusion of the monastic palace of El Escorial. The empire, held together by a determined king keeping the bureaucracy together, experienced a setback when a less-trusting ruler came to the throne. Philip II distrusted the nobility and discouraged any independent initiative among them. While writers of the time offered novel solutions to Spain's problems such as using irrigation in agriculture and encouragement of economic activity, the nobility never really produced anyone that could bring about serious reforms. Charles, on becoming king, clashed with his nobles during the Castilian War of the Communities when he attempted to fill government positions with effective Dutch and Flemish officials. Philip II encountered major resistance when he tried to enforce his authority over the Netherlands, contributing to the rebellion in that country. The Count-Duke of Olivares, Philip IV's chief minister, always regarded it as essential to Spain's survival that the bureaucracy be centralized; Olivares even backed the full union of Portugal with Spain, though he never had an opportunity to realize his ideas. The bureaucracy became so increasingly bloated and corrupt that by the time of Olivares's dismissal in 1643, its deterioration had rendered it largely ineffective. As the 16th century had worn on, inflation in Spain (a result of state debt and, more importantly, the importation of silver and gold from the New World) triggered hardship for the peasantry. The average cost of goods quintupled in the 16th century in Spain, led by wool and grain. While reasonable when compared to the 20th century, prices in the 15th century changed very little, and the European economy was shaken by the so-called price revolution. Spain, which along with England was Europe's only producer of wool, initially benefited from the rapid growth. However, like in England, there began in Spain an inclosure movement that stifled the growth of food and depopulated whole villages whose residents were forced to move to cities. The higher inflation, the burden of the Habsburgs' wars and the many customs duties dividing the country and restricting trade with the Americas, stifled the growth of industry that may have provided an alternative source of income in the towns. Another factor was the militaristic nature of the Castilian nobility, which had developed during the centuries of the reconquest of the Iberian peninsula. They preferred careers in the government bureaucracy, the military, or the church, shunning economic activities. This militarism also meant that Spain exhausted its wealth and manpower in near-continuous wars. Under Philip II, these wars had much to do with combating Protestantism, but in the 17th century it became clear that the world that had existed before 1517 could not be restored. Spain's wars during that century became increasingly more to do with preserving the hegemonic power of the Habsburg alliance in Europe; although it should be noted that the Habsburg alliance was successful in buttressing the Catholic Church against the rise of Protestantism. Sheep-farming was practiced extensively in Castile, and grew rapidly with rising wool prices with the backing of the king. Merino sheep were annually moved from the mountains of the north to the warmer south every winter, ignoring state-mandated trails that were intended to prevent the sheep from trampling the farmland. Complaints lodged against the shepherds' guild, the Mesta, were ignored by Philip II who received a great deal of revenue from wool. Eventually, overtaxed Castile became barren, and Spain, particularly Castile, became dependent on large imports of grain to make up for crop shortfalls, that, given the cost of transportation and the risk of piracy, made staples far more expensive in Spain than elsewhere. As a result, Spain's population, and especially Castile's, never dense on the generally very dry, rocky, mountainous peninsula, grew much more slowly than France's; by Louis XIV's time ( 1661-1715 ), France had a population greater than that of Spain and England combined. Credit emerged as a widespread tool of Spanish business in the 17th century. The city of Antwerp, in the Spanish Netherlands, lay at the heart of European commerce and its bankers financed most of Charles V's and Philip II's wars on credit. The use of "notes of exchange" became common as Antwerp's banks became increasingly powerful and led to extensive speculation that helped to exaggerate price shifts. Although these trends laid the foundation for the development of capitalism in Spain and Europe as a whole, the total lack of regulation and pervasive corruption meant that small landowners often lost everything with a single stroke of misfortune. Estates in Spain, and especially in Castile, grew progressively larger and the economy became increasingly uncompetitive, particularly during the reigns of Philip III and IV when repeated speculative crises shook Spain. Since the medieval period the Catholic Church had always been important to the Spanish economy. This importance increased greatly in the reigns of Philip III and IV, who had bouts of intense personal piety and church philanthropy, donating large areas of the country to the Church. The later Habsburgs did nothing to promote the redistribution of land. By the end of Charles II's reign, most of Castile was in the hands of a select few landowners, the largest of which by far was the Church. It has been estimated that at the end of the 17th century the holdings of the Spanish church had expanded to include nearly 20% of Castilian land and that the clergy made up as much as 10% of adult males in Castile. Government policy under the succeeding Bourbon dynasty was directed to steadily reducing the Church's vast holdings, which by then had come to be seen as an impediment to the country's development. The Spanish Golden Age was a flourishing period of arts and letters in Spain which spanned roughly from 1550–1650. Some of the outstanding figures of the period were El Greco, Diego Velázquez, Miguel de Cervantes, and Pedro Calderón de la Barca. El Greco and Velázquez were both painters, the former most notably recognized for his religious depictions and the latter—now regarded as one of the most important figures in all of Spanish art—for his precise, realistic portraiture of the contemporary court of Philip IV. Cervantes and de la Barca were both writers; Don Quixote de la Mancha, by Cervantes, is one of the most famous works of the period and probably the best-known piece of Spanish literature of all time. It is a parody of the romantic, chivalric aspects of knighthood and a criticism of contemporary social structures and societal norms. Juana Inés de la Cruz, the last great writer of this golden age, died in New Spain in 1695. This period also saw a flourishing in intellectual activity, now known as the School of Salamanca, producing thinkers that were studied throughout Europe. ^ In modern Spanish: Monarquía de España. ^ The plague arrived by ship at Santander in 1596, presumably from a plague afflicted northwestern Europe. It then spread south along the main routes through the centre of Castile, reaching Madrid in 1599 and Seville by 1600. It finally petered out in Seville's hinterland in 1602. ^ Monarchia Hispanica.google.com, Monarchia Hispaniae. digital.ub.uni. Smith, Preserved (1920). Haskins, Charles Homer (ed.). The Age of the Reformation. American Historical Series. New York: Henry Holt and Company. OCLC 403814.